Coastal and inland agricultural areas also vulnerable to wind and heavy rain. First came the heat, drought and earthquake. And now, a hurricane? Wednesday afternoon, hurricane watchers were calling for four to eight inches of rain and stiff coastal breezes from the Carolinas to New England. That's assuming Hurricane Irene continues up the coast like Hurricane Bob in 1991. That won't bode well for corn crops already compromised by drought stress. 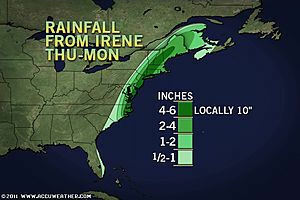 IRENE'S IMPACT: These AccuWeather maps show the storm track and rainfall projections as of yesterday afternoon. For the latest, go to accuweather. 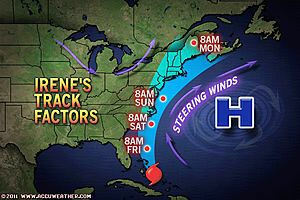 "An accelerating Irene will flirt with the Delmarva Peninsula and New Jersey then move on to eastern Long Island and southeastern New England," projects Alex Sosnowski, senior meteorologist for AccuWeather. Areas close to coastal cities can expect wind gusts of 60 to 80 mph, and rainfalls ranging from four to eight inches over the weekend and into Monday. This coast-hugging path will spare some areas from the worst effects, says Sosnowski. But heavy, flooding rain is possible anywhere from eastern North Carolina northward, despite the expected fast-moving nature of Irene. The flooding may be intensified in areas that have received torrential rainfall recently this month, such as coastal areas of the Northeast. The weather risks prompted Maryland Department of Agriculture to warn that Irene could impact the state as far from the coast as Western Maryland with inland flooding. Hurricanes can spawn tornadoes, flooding, flash flooding, hail and lightning. • Move all poultry and livestock to high ground and shelter in securely battened barns, houses, or tightly fenced areas. • Cover and secure all water, food, and medical supplies for poultry and livestock. • Pump and collect adequate supplies of drinking water in case of electrical failures. • Top off all gasoline, propane, and other fuel tanks. • Check operations of all portable generators. • Remove or secure all loose objects that could be moved by high winds. • Have available portable radios, extra batteries, flashlights and candles. The American Veterinary Medical Association (AVMA) offers a disaster preparedness booklet "Saving the Whole Family," which details information on disaster planning for small and large animals. It's downloadable in English and Spanish at: http://www.avma.org/disaster.